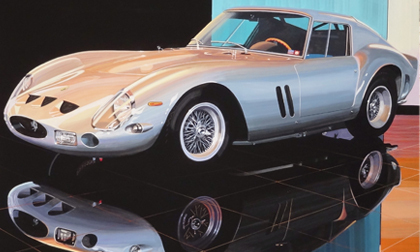 CARMEL, Calif. – August 2018 – Ken Eberts, an award-winning painter and founding member of the Automotive Fine Arts Society, will debut an original painting of the world famous Ferrari GTO at the group’s 35th annual exhibit during the Pebble Beach Concours d’Elegance on Sunday, August 26th in Carmel, California. This is the 21st year that Lincoln Motor Company will sponsor the AFAS exhibit on the Pebble Beach show field. Eberts’ Pebble Beach painting, entitled ‘GTO Reflection’, utilizes gouache on board; it measures 30” X 40”. The Ferrari 250 GTO, produced in very limited volume between 1962 and 1964, was a collaborative design led by Ferrari engineer Giotto Bizzarrini, with bodywork produced by Scaglietti. The GTO was effectively the pinnacle of Ferrari’s front-engined, competition era; it would be succeeded by Ferrari’s mid-engined 250 LM. While aerodynamic considerations were essential to the final design, the GTO’s almost innate sensuality is apparent on the track, and in – of course – Mr. Eberts’ interpretation. For fifty years, Ken Eberts has been considered one of his generation’s foremost automotive artists. His work continues to be featured at the world’s most prestigious automotive events. That work has been distributed widely, reproduced as magazine and book covers, Christmas cards, prints and promotional posters. A native of the Bronx, Eberts is a graduate of New York’s High School of Music and Art and Los Angeles’ Art Center College of Design. Eberts began his career as an automotive designer for the Ford Motor Company in the mid-60s. His body of work, much of which was influenced by that association, led to his appointment as Ford’s official Centennial Artist in 2003. In that capacity he created 13 original paintings commemorating Ford’s 100th anniversary. As a founding member of the Automotive Fine Arts Society, Ken has served as president since its inception. The AFAS has been an integral part of the Pebble Beach Concours d’Elegance since 1983.